Jimmy Torano and Day Dream. Photos copyright Sportfot. September 23, 2016 – New York, NY – USA’s Jimmy Torano jumped to an exciting victory in the $216,000 U.S. Open FEI Grand Prix CSI 3*, presented by Rolex, on a beautiful Friday night in New York City at the 2016 Rolex Central Park Horse Show (RCPHS). The faster of only two double clear rounds in a ten-horse jump-off with some of the world’s best, Torano and Day Dream took the win in front of the one-of-a-kind backdrop of skyscrapers over Sharn Wordley (NZL), who finished in the number two position for the second year in a row riding Barnetta. Conor Swail (IRL) had the fastest four-fault round to place third riding Cita. 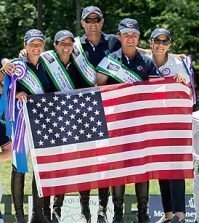 Friday’s competition in Central Park also featured a win for Ireland’s Judy Reynolds and Vancouver K in the U.S. Open FEI Dressage Grand Prix CDI 4*, presented by Axel Johnson. New York’s own Alexandra Crown and Basic got a win earlier in the evening’s $5,000 Junior/Amateur 1.20m Jumper Speed Class. The Rolex Central Park Horse Show runs through Sunday, September 25, with five days of multi-discipline equestrian sport for Arabians, jumpers, dressage, and hunters. The $216,000 FEI Grand Prix CSI 3*, presented by Rolex, and Friday night ceremonies will be broadcast on NBC Sports Network on Sunday, September 25, from 9-10:30 p.m. EST. 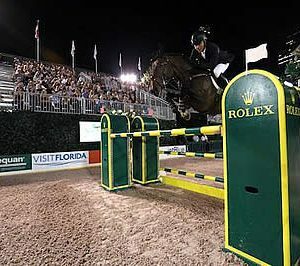 Olympic course designer Guilherme Jorge (BRA) set the track for the $216,000 FEI Grand Prix CSI 3*, presented by Rolex, on Friday night for 34 starters in Central Park’s Wollman Rink. Ten horse and rider combinations advanced to the jump-off, and only two were able to complete the short course without fault. Torano set the time to beat in the jump-off, with the first clear round in 37.05 seconds, and held on for victory. Wordley then went for a safer round to finish second on his time of 41.39 seconds riding the Sky Group’s Barnetta. Swail was blazing fast aboard Ariel and Susan Grange’s Cita in 33.12 seconds, but dropped a rail to finish third. McLain Ward (USA) and Double H Farm’s HH Carlos Z were also extremely fast in 34.89 seconds, but had an unusual rail at the first fence to place fourth. Kristen Vanderveen (USA) and Bull Run Jumper Five LLC’s Bull Run’s Faustino de Tili rounded out the top five with four faults in 35.19 seconds. Torano’s winning mount Day Dream is just eight years old, but shows exceptional talent that was on display Friday night. Torano and his wife Danielle own the Dutch Warmblood gelding (Zento x Heartbreaker) along with Daryl Portela’s Isalou, Inc., and imported the gelding from Europe two years ago. The pair competed at the American Gold Cup last week, and Torano took a chance on trying to get a spot to compete in Central Park this week. In 2015, Torano did the commentary for the NBC Sports broadcast of the RCPHS grand prix, and after experiencing the event so closely through that perspective, the rider wanted to compete even more. Wordley was very happy with his second place finish again this year riding Barnetta, a 12-year-old Westphalian gelding (Baloubet du Rouet x Polydor), and complimented his horse’s consistency. “I am ecstatic. Barnetta is a great horse,” Wordley stated. “He is not the fastest horse, but he is very consistent. He does clear rounds. Last year, there were only two in the jump-off, and my strategy was just to go slow and hope that everybody else had a rail down. I thought my luck had run out with ten in the jump-off this year, but luck went our way. Wordley also remarked on the course building for Friday night and praised Guilherme Jorge on a job well done. Conor Swail and Cita had a fantastic week, also placing second in Thursday’s $40,000 U.S. Open Canadian Pacific FEI Speed Class and carried on to a third place finish Friday night. Swail has had great results with the ten-year-old Holsteiner mare (Casall x Pik Ramiro) all year. While he thought that he took a little too much risk in the jump-off, he remains extremely happy with his mount. “I thought she was outstanding tonight,” Swail stated. “The first round was a beautiful round. Then in the jump-off – the problem I have with her is that I never think she is going to knock anything down. She is so careful, and she rarely has a jump down in front. I just felt that I needed to be very fast because of a couple of the top guys were after me there with very fast horses. Basically, I made a little bit of a mistake. I cut in very tight, and I probably needed to square up my turn slightly better, but because I am riding so much quality and I felt that it did not matter where I was or what angle I was going at, I took a risk and unfortunately it did not pay off today. In the event’s third year, International Equestrian Group and RCPHS founder Mark Bellissimo has seen his vision to showcase equestrian sport in an iconic venue grow to great heights. As the RCPHS continues to grow, the United States Equestrian Federation (USEF) has also been a great supporter of the event, and Vicki Lowell spoke to the quality on Friday night as a USEF representative. With a clear round to win Thursday’s $40,000 U.S. Open Canadian Pacific Speed Class and another clear round in Friday night’s $216,000 FEI Grand Prix CSI 3*, presented by Rolex, McLain Ward (USA) earned the second annual U.S. Open Championship and was presented with a $25,000 rider bonus to conclude jumper competition at the 2016 Rolex Central Park Horse Show. Friday’s festivities also included a special performance by Frederik the Great: The World’s Most Handsome Horse, and a ceremony honoring the U.S. Dressage Team Olympic Bronze medalists; U.S. Show Jumping Team Olympic Silver medalists; and Phillip Dutton, Olympic Individual Bronze medalist. Competition continues on Saturday with the Pony Hunters, Junior/Amateur-Owner Hunters, and Professional Hunters in the U.S. Open Hunter Duchossois Cup, presented by The Gochman Family. 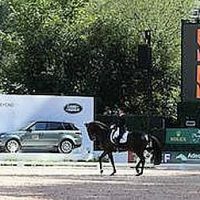 The Rolex Central Park Horse Show hosted its first-ever international dressage grand prix CDI4* in Wollman Rink on Friday afternoon with a win for Olympians Judy Reynolds and Vancouver K of Ireland with a high score of 73.80%. 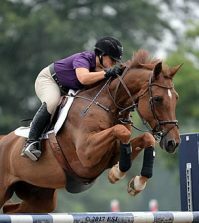 Reynolds guided the 14-year-old Dutch Warmblood gelding (by Jazz out of Phantastia) through a beautiful test for the first time in Central Park and had a great experience. Owned by Joe and Kathleen Reynolds, Vancouver K has come long way with Reynolds and proved his development with a solid performance in the exciting atmosphere of Central Park. “A little less than two years ago we made the decision to really expose him to atmosphere because he had not been dealing with it that well,” Reynolds detailed. “He is quite a hot horse. We went to the World Equestrian Games in 2014, and it just did not work at all. He just did not deal with the atmosphere and all the attention, so we made the decision to go to big competitions. We did World Cup and things like that last year, which really exposed him to different venues and environments, and that was really important for us. Sweden’s Tinne Vilhelmson-Silfven and Lovsta Stuteri’s Paridon Magi finished second with a score of 73.14%. Canada’s Brittany Fraser-Beaulieu and her own All In placed third with a 71.06%. 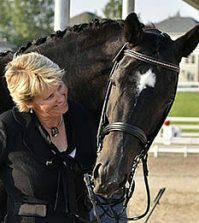 Vilhelmson-Silfven was also at the Olympic Games in Rio with her top mount Don Auriello and took the opportunity to rest the stallion while bringing Paridon Magi back to Central Park for his second year at the competition. 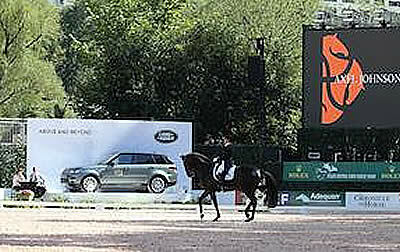 The seven-time Olympian was also very happy to have this year’s CDI4* rating and enjoyed her Grand Prix test on Friday. Third place finisher Brittany Fraser-Beaulieu of Canada also had a great time competing in Central Park. This was her first time in the busy atmosphere of the Park and her horse All In took it in stride. Judge Gary Rockwell commented on the day’s results and acknowledged the top three horses and riders on their efforts. Dressage competition continues on Saturday evening with the U.S. Open $75,000 FEI Dressage Freestyle CDI 4*, presented by Axel Johnson. The evening will also feature a special freestyle demonstration from three-time Olympic gold medalists Charlotte Dujardin and Valegro. Kicking off Friday evening at the 2016 Rolex Central Park Horse Show, Alexandra Crown (USA) and her ten-year-old Dutch Warmblood mare Basic (Silverstone x Indoctro) were the winners of the $5,000 Junior/Amateur 1.20m Speed Class. Olympic course designer Guilherme Jorge (BRA) set the track for Friday’s speed competition, with 12 entries and four clear rounds. Last to go, Crown and Basic clocked the winning time of 66.14 seconds. Claudia Villamil (PUR) and her own Infinity placed second in 68.42 seconds. Lisbeth Hazoury (DOM) rode Los Establos Sporthorses Corp.’s Grey van de Castanoschans to third place in 70.09 seconds. Fourth place honors were awarded to Lilli Hymowitz (USA) aboard Rose Hill Farm’s Elatrice in a time of 71.09 seconds. 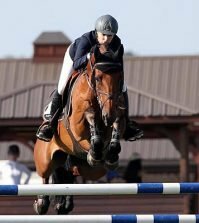 A New York City resident, 21-year-old Crown rode at the inaugural RCPHS in 2014 and returned this year with two top horses, also finishing second in Thursday night’s $25,000 U.S. Open Hollow Creek Farm Under 25 FEI Grand Prix aboard her own Von Cim. This was her first time to take a win in the world-famous Central Park event and a memorable moment for the young rider. Crown, who trains with U.S. Olympian Kent Farrington, has had many international wins around the world aboard Basic and knew that the mare would try her hardest in the night’s competition. Wrapping up a special night in her young career, Crown acknowledged the incredible atmosphere while competing in Central Park. Competition in Central Park’s Wollman Rink continues through Sunday, September 25, with more multi-discipline equestrian sport. For more information and full results, visit www.centralparkhorseshow.com.